Z-Balloon Adventures was founded in 1988. After many years of yearning to fly a Hot-Air Balloon, Dan Campbell purchased his first Hot-Air Balloon, a 1985 National Ballooning, LTD AX-8 90,000 cubic foot Hot-Air Balloon and immediately began flight training. Dan was trained under the guidance of Phil Gray, a noted Hot-Air Balloon Designer and Manufacturer, Balloon Race Organizer, FAA Certified Repair Station Operator, and President of National Ballooning, LTD. and all around Balloon Guru! After many flight hours, Dan went on to obtain his Commercial LTA Pilots Licence and so it all began! Dan obtained his first commercial contract flying for a local Rock and Roll Radio station, Z93 and then went to fly for KGGO then we went on to fly for 6 years for "Car-X Brake and Mufflers". We also flew for United Parcel Service and "Wonder Bra"and he also flew the RE/MAX Balloon for over 15 years! 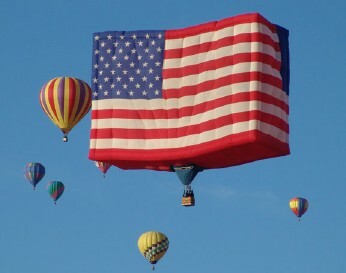 Dan has recently added flying Special Shape balloons, Flying and Tethering the "US Flag Balloon" at the Albuquerque International Balloon Fiesta as well as the Flighthouse Balloon. Although many balloon companies have come and gone , Z-Balloon Adventures has gone on to expand to a fleet of 5 Hot-Air Balloons, as well as 7 Cold-Air Advertising Balloons and 8 Advertising Blimps! We are the only full time balloon ride company left in Iowa. We recently added "Burnie the Little Devil Balloon" to our fleet. Thus making us the The Largest Full Time, Full Service Balloon Company in Iowa! We are especially proud to have introduced so many people to the fun side of ballooning!